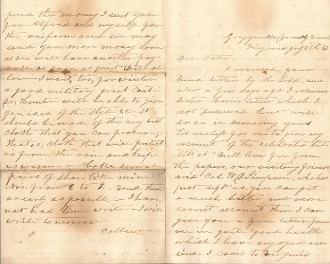 Confederate Soldier's Letter, 4 pages, 8vo., Greggsville (formally Viena) Virginia, July 29th, 1861. W. C(ollier) Winn (Co. D., 3rd South Carolina Battn Infantry) writes to his Father. "...This useless for me to give any account of the celebrated battle of Bull Run for from the papers our visiting friends and Col. W. D. Simpson, who has left us, you can get a much better and more correct account than I give you...since i came to Virginia Alfred is sick with the measels also about 40 other members of our company but I hear they are all doing well, having gone to the general hospital at Culpeper, Charlottesville and other places. I heard that Alfred is much better...our baggage was left at the wagons during the fight and I had the misfortune to lose all mine...We have no use for many articles of clothing, for it is impossible for us to carry them on the march, but we want very substantial articles. I want for myself a heavy worsted shirt, 2 prs. drawers of same fabric, 2 prs. Woolen socks, a few handkerchiefs and towels. I would like too have a compact light leather knapsack. About the uniform suit, I understand now that we are to have a regimental uniform but we will have it made at home. We want a good heavy uniform, one that will do us good winter service. I do not know what arrangement will be made, but we must have it soon...I want too for winter a good military great coat Dr. Hunter will be able to give you idea of the style & c-21 should be made of the very best cloth that you can procure, that is, cloth that will protect us from the rain and keep us warm ...Collier"